LUMPENPROLETARIAT Political Science Professor Jodi Dean (b. 1962) (Hobart and William Smith Colleges) is the author of various books, including The Communist Horizon (Verso, 2012), Democracy and Other Neoliberal Fantasies: Communicative Capitalism and Left Politics (Duke University Press, 2009), Žižek’s Politics (Routledge, 2006), Blog Theory (Polity, 2010), and Publicity’s Secret: How Technoculture Capitalizes on Democracy (Cornell University Press, 2002). She also blogs at ICite.com. DOUG HENWOOD: “Hello, and welcome to Behind the News. My name is Doug Henwood. Just one guest today: Jodi Dean. Jodi Dean, a professor of political science at Hobart and William Smith Colleges, in Geneva, New York has been on this show many times. Though, it’s been more than a year, since her last appearance, which is way too long. I find her one of the best thinkers on politics around, bringing, among many other things, a sense of the importance of organisation, as opposed to the love of structural-lessness and spontenaity, which is so popular these days and of the centrality of the psychological mechanisms to politics. Yet, despite the complexity of the material, Jodi writes and talks with admirable clarity. “She was on this show back in October 2013 to discuss her book The Communist Horizon, also from Verso. In that book, she was trying to reclaim the idea of communism, a word and concept, which has been dragged through the mud by, both, its friends and enemies. In her latest book, Crowds and Party, published earlier this year by Verso, Jodi undertakes two related texts—an analysis of crowds, demonstrations, spectacles, occupations and politics, which we always have with us, and the need for a revolutionary party, which we don’t. “Jodi isn’t shy about calling that organisation a party, a rather unfashionable term. “As I say in the interview, I shied away from bringing up the psychoanalytic aspects of Jodi’s argument because I was afraid it might not work well on the radio. But those aspects are quite important and one of the many reasons you should buy and read this book—that and her extended critique of the individualism, that pervades our society and our minds, myself included. I’m not so sure how well I work with others. “That’s another angle on the importance of the party organisation. Not only is it essential to politics, it’s also a way to get us out of our solipsistic little heads, myself included. I spend a lot of time in my own head, in my personal bubble. “And, then, the collective energy and the collective capacity dissipated. Right? We had a capacity, at the beginning, actually, to take the park. And, then, once each person started deciding for herself what was best for her, our capacity disintegrated. And we no longer had it. “And, so, of course, it became like: Well, there were exams at NYU next week. And people were really busy and hadn’t planned. So, maybe they needed to do something else. And, so, it was like put off for another time. And everybody ended up going home. DOUG HENWOOD: What you write about—you talk about here really captures the frustration many of us felt about Occupy, that it was very skeptical about agendas, about structures, about turning this very exhilarating moment into something more permanent and, potentially, more transformative. DR. JODI DEAN: “Yeah. [snip] (c. 8:45) And there’s been a shift away from thinking organizationally and strategically, in terms of taking power, in terms of a struggle for power. “And that has been pushed away, in favour of an approach, that looks at personal transformation, small-group transformation, immediacy, making our immediate relations better. And this making our immediate relations, whether or not they’re self-relations or small-group relations, making those better has been the form of political struggle. “I think it’s a form, that is, ultimately, politically damaging, bereft, and the left response to, and incorporation into, neoliberalism, or late capitalism. Right? “It’s not a real form of political struggle. It’s only a kind of minor individuated resistance. Catapulting social movements, such as Occupy Wall Street, towards building a revolutionary political party is a topic, which many of us have emphasised for years, including in real time and in an interview for Media Roots with Alexa O’Brien, from US Day of Rage, one of the four groups, which started the Occupy Movement. Terrestrial radio transmission, 94.1 FM (KPFA, Berkeley, CA) with online simulcast and digital archiving: Behind The News, this one-hour broadcast hosted by host Doug Henwood, Thursday, 24 NOV 2016, 12:00 PST. Is Former Stanislaus County Sheriff’s Detective Kari Abbey Getting Away With Murder? LUMPENPROLETARIAT—Ostensibly, our community police agencies are endowed with extraordinary lethal force and firepower because they are charged with protecting and serving our local communities. Unfortunately, the outrageous numbers of extrajudicial killings by police of innocent unarmed civilians doesn’t allow them that reputation. The questions becomes: what resistance shall we, the people, dignify? Stay tuned, as community protests will likely follow. A case against a former Stanislaus County sheriff’s detective once accused in a deadly shooting has been resolved. Kari Abbey initially was charged with murder in the 2010 shooting of Rita Elias. But Stanislaus Superior Court Judge Ricardo Córdova later dismissed the murder charge after determining Abbey fired her gun in self-defense. What remained of the case against Abbey were felony charges that included allegations of embezzling from the Sheriff’s Department, cultivating marijuana, unlawfully evicting her tenants, child endangerment and illegal possession of steroids. The embezzlement charge stemmed from allegations by investigators and co-workers who said Abbey spent half of her time at the Sheriff’s Department attending to personal business associated with her family’s rental properties. With the plea deal, Abbey pleaded no contest to unlawfully entering a home and possessing steroids, both misdemeanors. The felony charges were dropped. Abbey, 39, was sentenced to three years of probation, 40 hours of community service and $225 in restitution to the Sheriff’s Department, according to Assistant District Attorney Dave Harris, who prosecuted the case. Michael Rains, Abbey’s attorney, said both sides took a more realistic and pragmatic approach to the evidence after further review of the case. “Some of these charges, in my opinion, wouldn’t have held up in court in front of jury,” Rains said Friday. He said he didn’t think Kari Abbey committed the crimes to which she pleaded no contest, but said his client did not want to spend more than $100,000 taking this case to trial. Rains said the taxpayers also would have had to pay for what likely would have been a three-week trial. Rains, based in Pleasant Hill, has a connection to a case involving the prosecutor. A year ago, Harris and prosecution investigator Steve Jacobson faced contempt-of-court charges related to allegations of improperly contacting an alternate juror and failing to notify the court in a trial of Modesto bail bondsman Aleo John Pontillo. Rains represented Jacobson in that case. Learn more at THE MODESTO BEE. LUMPENPROLETARIAT—It is, indeed, appalling how large a percentage of our incomes some of us spend on cable television. But, at least, there are some perks. Show Me A Hero is one of them. This new mini-series starring Oscar Isaac with Jim Belushi, Catherine Keener, Winona Ryder and various other notable actors is a fascinating view of urban economics and politics. DAVID ZURAWIK: “Yeah, Andy. And it’s far and away the best production of the summer. I think it’s one of the best productions I’ve seen in years on television—period. It’s called Show Me a Hero. It’s a six-hour mini-series the next three Sundays on HBO—two hours a night. It’s really outstanding work. It’s written and executive produced by David Simon and Bill Zorzi, both of whom had been [Baltimore] Sun employees. And it’s directed and executive produced by Paul Haggis from [the film] Crash, who’s outstanding—great, great talent. “It covers a desegregation battle in Yonkers, New York, a city of about 200,000 north of New York in 1987. It started in 1987. This mini-series covers 1987 and 1993. It’s based on a non-fiction book by then-New York Times reporter Lisa Belkin. And it’s a terrific, a really outstanding book. They went and re-reported it. They did the story. “It follows a young, on-the-rise, elected official in Yonkers named Nick Wasicsko. And he’s played in this by Oscar Isaac. You may not have heard of Oscar Isaac. He is outstanding—honestly. An Emmy doesn’t even seem good enough for the performance he turns in as the city councilman who becomes mayor at 27, the youngest mayor in a mid-to-large American city. But, then, there’s a desegregation lawsuit from the NAACP and the Justice Department, that aims only, really, to build 200 units of low-income housing in the part of Yonkers, that was predominantly white. He is chewed up in this battle. His career is shredded. His life is disrupted. It’s a great story. 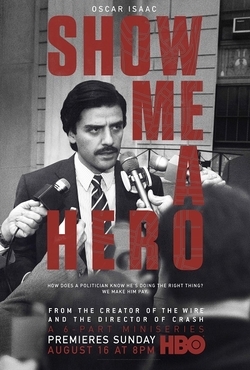 THE BALTIMORE SUN—(14 AUG 2015) When David Simon first contacted William F. Zorzi in the fall of 2001 about the book “Show Me a Hero,” Simon’s former Baltimore Sun colleague says he was mainly annoyed. “I was on the desk and on deadline at The Sun,” said Zorzi, who was then working as an assistant city editor. But when Simon called back three weeks later, Zorzi still had not read the book. He couldn’t even remember the title. Not only did Zorzi read journalist Lisa Belkin’s non-fiction book about a community-wrenching housing desegregation battle in the late 1980s in Yorkers, N.Y., he came to live it for the next 13 1/2 years. The veteran political reporter quit The Sun in 2002, went to Yonkers to “re-report” the book, and has been working on the project on and off ever since. Off includes three seasons on Simon’s “The Wire” as a writer, including the final year of episodes in which he also played himself onscreen as a Sun reporter named Bill Zorzi. The result of that kind of commitment shows in virtually every frame of this six-hour HBO miniseries that speaks to our post-Ferguson-post-Freddie-Gray America like no other work on TV — or in any other form of art so far. Learn more at THE BALTIMORE SUN.